Automotive Part Cleaners & Degreasers Market size was over USD 37.5 billion in 2017 and industry expects consumption at over 7 billion gallons by 2024. Growing importance of vehicle maintenance and servicing is likely to stimulate automotive part cleaners & degreasers market growth. Global automobile maintenance & repair services market was valued at about USD 480 billion in 2017, which indicates tremendous growth opportunities. These products help restore the aesthetic quality of cars and improve life span which in turn increases their resale value. They help in removing dirt, and other residue which lowers the performance and market value of the vehicles. Booming construction sector, low production costs and availability of economic labor in China and India will further stimulate product demand. 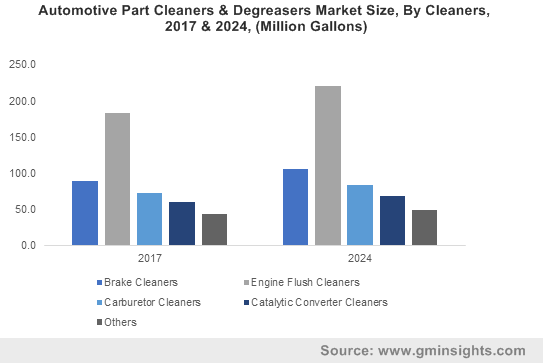 Rise in demand for clean, efficient and energy-saving engines primarily owing to emission-control regulations should promote automotive part cleaners & degreasers market growth. EU legislation aims to reduce greenhouse gas intensity of automobile fuels by 10% by 2020, which represents tremendous market growth potential. The gradual development of sludge, varnish and other residue build up affects normal vehicular operations, thus leading to poor performance, increased fuel consumption and decreasing vehicle lifespan. These products clean the entire lubrication system, improve vehicle efficiency and longevity which is likely to accelerate automotive part cleaners & degreasers market growth. Automotive part cleaners often consist of various toxic solvents, powders and additives which are often carcinogenic in nature and present the risk of damaging the central nervous system. These products also contain corrosive acids and alkalis which can damage vehicle surfaces, create burn risks for workers and have adverse environmental effects which may hamper market growth. Global brake cleaners market size may witness gains close to 2.5% up to 2024. These products improve vehicle brake performance by safely removing brake fluid and helping the brakes last longer, enhance vehicle efficiency and remove contaminants such as grease, oil, dirt. Increasing consumer disposable income and rising awareness of benefits of using brake cleaners should further stimulate product demand. Global carburetor cleaners market size is likely to exceed USD 4.3 billion by 2024 on account for growing adoption of passenger cars, motorbikes, and lawn & garden equipment. This product ensures the removal of heavy debris and gunk from a vehicle’s carburetor, which reduces the possibility of declining performance owing to contamination. Significant product demand in heavy-end commercial vehicles and public transport vehicles to enhance engine efficiency by cleaning automatic chokes will stimulate automotive pat cleaners & degreasers market growth. Global engine degreasers market size exceeded USD 9 billion in 2017 pertaining to their crucial role in removing grease, oil & dust from engine parts and hard surfaces. These products are primarily used to overcome lowered performance & fuel efficiency of an automobile and prevent damage over time. Increase in global vehicular traffic and prolonged automobile life should boost automotive part cleaners market growth. Water-based automotive part cleaners & degreasers market demand is likely to register gains of over 2.5% in the forecasted timeframe pertaining to stringent environmental regulations to reduce air emissions. These products ensure the removal of a wide range of contaminants, enhance rinsing capability and provide a chemical-free substrate for subsequent processes. Growing demand for sustainable products and environment-friendly nature of water-based automotive part cleaners & degreasers should further accelerate market growth. Solvent-based automotive part cleaners & degreasers market size was valued at over USD 22 billion in 2017 owing to their efficient performance. They offer excellent cleaning power, fast evaporation, and removal of thick baked oil, dirt, & other contaminants from sensitive components. Significant growth in vehicle sales and the presence of a variety of strong solvents in the product should further boost market growth. Automotive part cleaners & degreasers market size from two wheelers may witness gains at over 2.5% owing to the high popularity of these vehicles, high affordability and low maintenance cost. These products play a vital role in timely servicing and maintenance operations by removing caked-on mud and tough grime. Substantial disposable income in North America and Europe has increased consumer involvement in off road activities, bike racing & stunts which should stimulate two wheeler adoption and accelerate market growth. North America, driven by Canada and the U.S. automotive part cleaners & degreasers market size should surpass USD 8.5 billion by 2024 owing to increasing use of gasoline direct injection engines (GDI) in plug-in hybrid electric vehicles. These products ensure the elimination of deposits in GDI engines, which creates regular & smooth airflow, thereby avoiding rough idling. Growth in charging infrastructure, stringent emission norms, and the improved availability of rapid-charging stations should stimulate GDI engine usage and thus enhance product demand. Europe automotive part cleaners & degreasers market demand driven by Germany, UK, France, Italy and Spain may register gains close to 2% in the forecasted timeframe. Significant competitiveness in the vehicle parts & components sector and stringent government regulations regarding air emissions should propel regional industry growth. Engine and fuel system degreasers help remove fuel system deposits which increases efficiency and reduces emissions. Rise of automotive part imports owing to tough regulatory requirements and to achieve fuel savings is predicted to further promote market growth in the region. 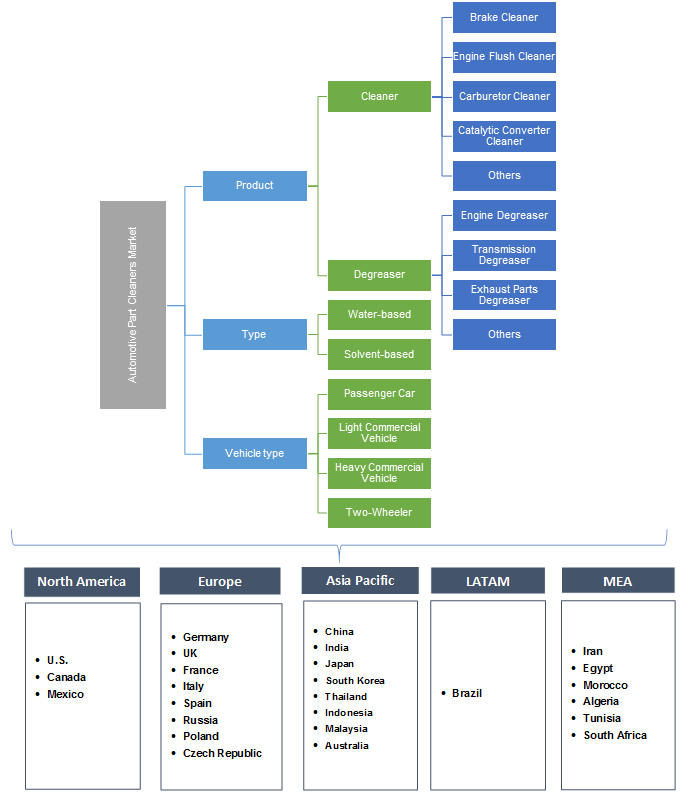 Asia Pacific driven by India, Japan, China automotive part cleaners & degreasers market size may register significant gains at over 2.5% by the end of foreseeable timeframe. The region has a high average age of vehicles as they are not scrapped early, which ensures a steady demand for cleaners & degreasers for regular maintenance activities. Rising consumer aspirations and growth in disposable incomes should stimulate small car sales, thereby increasing product demand. Global automotive part cleaners market share is less competitive and consolidated among various market participants such as 3M, BASF, DowDupont, Valvoline, WD-40 and Fuchs Group. Major manufacturers are focusing on developing new products to expand their product portfolio and attract new customers. Automotive part cleaners remove unwanted particulate, oil and water-insoluble substances for the effective maintenance and repair of vehicle interior & exterior components. These products offer tough cleaning performance with minimal scrubbing that improves vehicle efficiency. Rising household incomes and stringent emission-related regulations are likely to stimulate automotive part cleaners market growth.